Essex Capital Group, Inc. (“Essex”), announced today that the firm recently arranged a $95,000,000 acquisition financing and recapitalization for CAN Community Health, Inc. (“CAN” or the “Company”), a private, not-for-profit organization dedicated to the treatment, care and continual wellness of people living with HIV, hepatitis C, STDs and other diseases. The Company has been serving the needs of the HIV community in Florida and the Southeast US since 1991. CAN currently operates 34 medical clinics, offering medical, dental, psychological and lifestyle counseling to all patients, regardless of their financial situation, insurance status, or ability to pay. 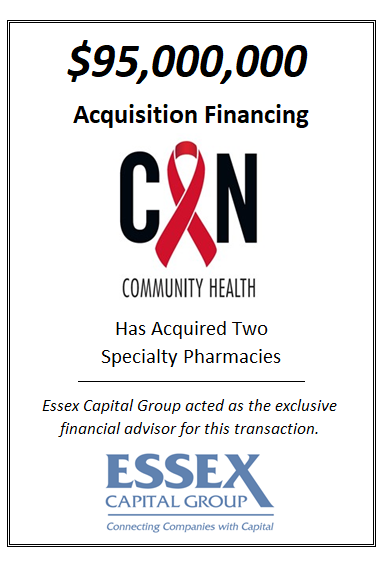 As a part of this transaction, Essex structured and negotiated two separate specialty pharmacy company acquisitions on behalf of CAN, subsequently arranging a comprehensive acquisition term debt financing solution. The financing structure also provided a $30 million merchant card program to fund the tremendous organic growth currently being experienced by the Company. Essex Capital acted as the Company’s exclusive financial advisor in this transaction.